Residents of Riverview Apartments enjoy enthralling views of the magnificent Tongue River and historic Miles City. 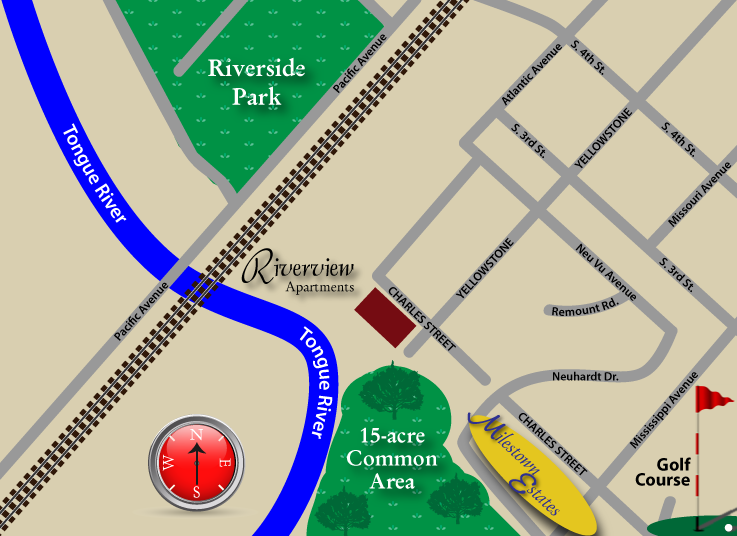 Riverview Apartments is located just a short walk from Miles City Town & Country Club’s challenging 9-hole golf course. Riverview Apartments was engineered and constructed using state-of-the-art technologies, methods and materials that ensure that each residence is a uniquely quiet home. Residents of Riverview Apartments enjoy full access to the 15-acre common area – great for picnics, nature walks or just some relaxing time sitting on the banks of the Tongue River listening to it flow towards its destination. Residents of Riverview Apartments, as well as their guests and delivery personnel, will enjoy the convenience of the large elevator which services every floor of the building. The spacious elevator makes move-in much easier, faster, safer and facilitates deliveries, aids the elderly and disabled and keeps families together as they move between floors. Cooler cars in summer, no ice-covered windshields in winter. The ground floor of the building has been engineered for protected parking. This well ventilated covered parking area keeps vehicles out of the weather, and allows residents of Riverview Apartments to access their vehicles and homes without concern about inclement weather. Entry into Riverview Apartments will be limited, and controlled by state-of-the-art security systems. Further, the location of the building affords residents an additional, comfortable measure of security. Each apartment home in Riverview Apartments has its own private, outdoor deck. These balconies make enjoying the amazing views easy, and provide residents with a place for outdoor relaxing and BBQs. All of the Riverview Apartments offer residents a generous living space, as well as plenty of outdoor space for BBQs and relaxing. The living area has been meticulously designed to maximize efficiency and spatial relationships. Generous windows frame the views and welcome natural light into each and every home at Riverview Apartments. Like all the materials used for construction, the windows effectively block and deaden sound – ensuring the residents’ privacy and quiet living. The kitchens at Riverview Apartments have been designed for the highest levels of efficiency while preparing and serving meals. Coupled with the superb array of premium appliances, these designs will appeal to even the most discriminating cooks. Each and every one of the Riverview Apartments offers its residents the advantages of a full bath. Even for shower-takers, a long, hot soak in a tub can be just the thing for sore or injured muscles. Energy efficiency has been taken into account in virtually every phase of creating Riverview Apartments. From the power conserving appliances to the low-flow water systems to the abundant insulation; Riverview Apartments supports responsible environmental standards. Riverview Apartments is a professionally managed property. Professional management ensures residents of a conscientious approach to maintenance and improvements as well as immediate, effective attention to problems.